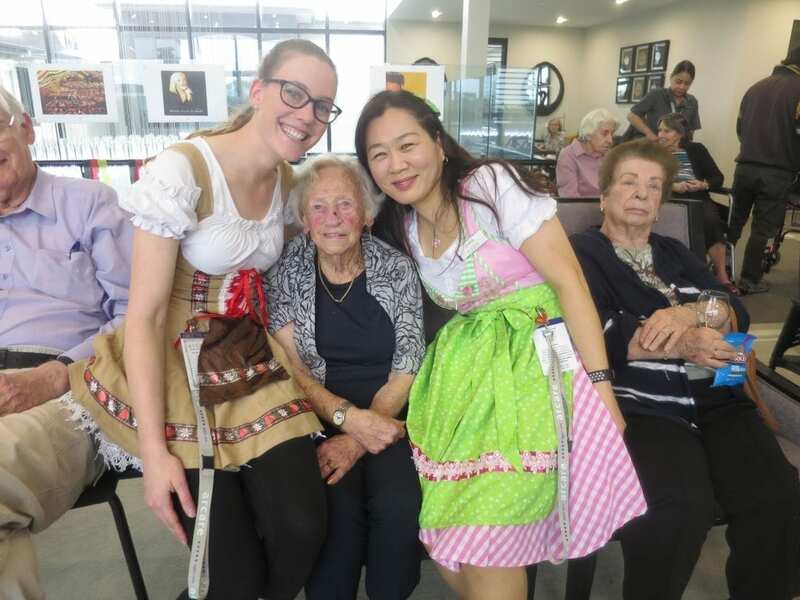 Oktoberfest celebrations at Arcare Glenhaven brought happy tears to one every appreciative German resident ‘Lore’. For the month of October, Glenhaven celebrated everything German. The Oktoberfest happy hour had German beer, pretzels, bratwurst sausage, German music, themed quizzes, decorations and outfits! The highlight of the event was what it meant to German resident Elenora (Lore) Sholkie. Lore arrived in Australia in 1949 from German after she fled the war with her husband. Lore has told many stories of her hard times in Germany, but she always has a positive outlook on life. She is so thankful to be living in Australia with her family but will always have love for her country. When Lore saw the 2 staff members dressed in German beer maid outfits, she immediately burst out laughing but then hugged them with a true sense appreciation and thankfulness. She was so excited that she refused to sit down and instead was ushering and encouraging everyone to come as if it was her own special event. Lore knew the question to every trivia question and found it fascinating that everyone knew so much about her country. Lifestyle Assistant Chris played 12 German and Oktoberfest themed songs on the piano which Lore would sing passionately and often would close her eyes as she sang. She was even dancing in her seat to upbeat songs and encouraging others to wave their arms. Chloe asked Lore if she enjoyed the Oktoberfest and before she could answer she burst into tears and grabbed her hands; thanking Chloe and Chris for everything. ‘I feel so special and loved,’ said Lore. Lore was the last to leave the event, as if she was taking in all the emotions and memories from her past. ‘It was very special to see and be a part of,’ said Chloe.